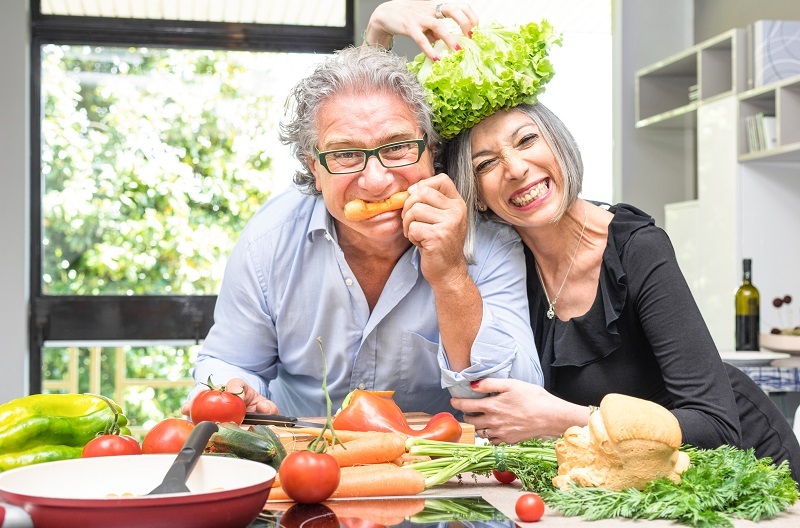 Senior couple having fun in kitchen with healthy food. When it comes to health, the highest priority should be to keep the heart healthy. One way to keep the heart healthy and functioning properly is to eat the right foods and to get a decent amount of exercise. The Centers for Disease Control and Prevention states that one in two adults lives with a chronic disease and “only half of adults get the physical activity they need to help reduce and prevent chronic diseases” (cdc.gov, 2016). If you find that you are not getting enough exercise, try walking in the mall, in the park, or even around the block to get the blood flowing. Remember that exercise works hand-in-hand with the foods that you eat. Meaning, if you eat the right foods, you will also have a lot more energy to exercise, so be aware of your eating habits and establish a healthy eating plan. According to the Dietary Guidelines for Americans 2015-2020, a healthy eating plan emphasizes fruits, vegetables, whole grains, and fat-free or low-fat milk and milk products; it includes lean meats, poultry, fish, beans, eggs, and nuts; it is low in saturated fats, trans fats, cholesterol, salt (sodium), and added sugars (health.gov, 2015). Foods such as tomatoes, avocados, berries, and beans are all great choices, and they are well known foods that promote a healthy heart. Many researchers often comment on the psychology of people and how most will focus on the foods that they CAN’T eat rather than the foods that they CAN eat. Refocusing on the positive aspect of eating healthy can help realign the benefits with a person’s interests. As a chiropractic website, we are all about realigning and adjusting one’s perspective. Fruits are always a great choice. Don’t just focus on apples, oranges, and bananas. Instead, try something exotic like a mango or pineapple or a kiwi. If it’s not the season for your favorites fruits, it’s okay to settle for the frozen or canned product. However, with frozen or canned fruits, it is important to be aware of the added sugars and syrups, so be sure to choose the canned fruits that are in water or in their own juice. Vegetables are also great for maintaining one’s health. Get out there. Try new vegetables and new ways to cook them. For example, try grilling vegetables or steaming them with herbs to bring out a new flavor. Frozen or canned vegetables are also great for a quick snack or complimentary side to your main course. However, be aware of frozen vegetables with added salt, butter, or cream sauces. Although they taste yummy, they may be doing more harm than good. For more tips on healthy living, contact your local chiropractor. A good chiropractor will understand how a healthy spine and a healthy body work closely together. I liked that you had mentioned that it could be important to find a chiropractor that can help fix any possible problems. My wife has been having problems with her back and we haven’t been able to fix them with anything and we’re looking for an alternative medicine. I’ll have to start looking into finding a chiropractor that can help with this and help her with any possible problems that she could have.